I love mixing it up when it comes to the materials I use in my jewellery pieces. I found these French antique cream buttons with inset rhinestones at Rollo on one of my visits there. I love the design of these buttons - so simple and eye-catching. But it took me a while to decide what I wanted to make with them! It was only when I was looking through some fabric pieces I had at home, that I saw how good the buttons looked with these silver ferns. I was suprised to find that the ferns are actually 24ct gold thread mixed with white. I bought them at Kawachi Artists' Materials in Osaka. The shop is on the 8th floor of the Tokyu Hands building in Shinsaibashi. I love both of these shops because you can find almost any arty or crafty thing you might need there! I think the fabric pieces are usually used as appliqués on clothing but I thought they'd work well in jewellery pieces because they're so light and delicate. Lately, when I've been shopping in Japan, I've noticed some accessories (usually necklaces) with elements of fabric and lace worked into them so I though I'd try it for myself. I connected the buttons with the ferns by wrapping some fine artist's wire around the ends to make loops for the jump rings. 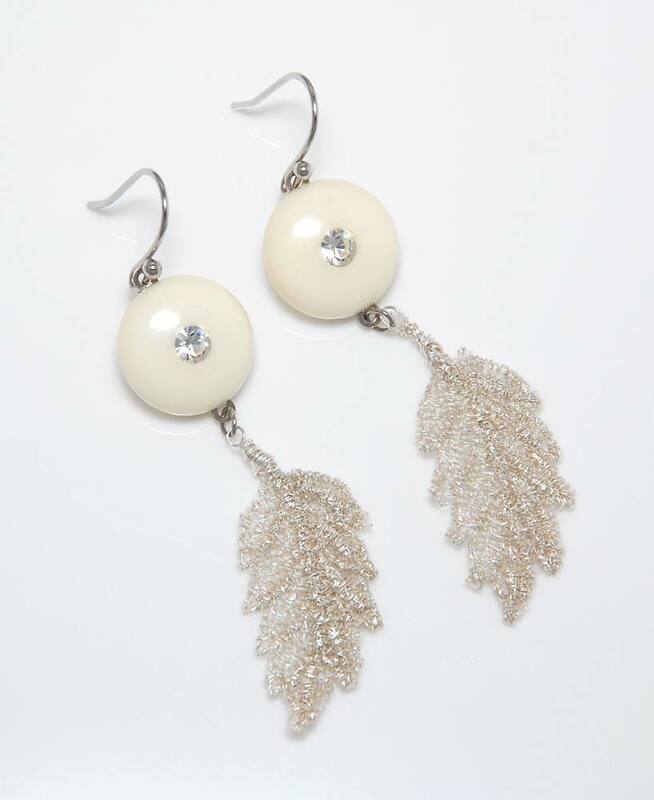 When you wear the earrings, the ferns look a little like wings that flutter and catch the light as you move. So there's something old and something new in these earrings. I guess I'll have to keep searching for something borrowed and blue! Do you own any jewellery with a fabric element?